Welcome back to the Virtual Book Club for kids. This month the VBC is featuring books by one of my favorite authors, Tomie DePaola. Choosing a dePaola book for the VBC was tough. I finally decided to choose "The Popcorn Book". It was a fall favorite when I was teaching school. In fact, I used it with children through fifth grade! 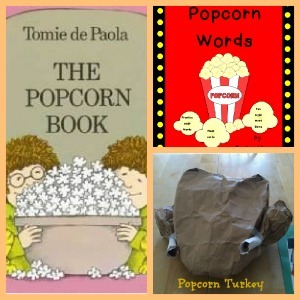 The Popcorn book isn't necessarily a Thanksgiving book, it can be used any time of the year. However, all of the references to Native Americans, corn, Thanksgiving, and food make it a great choice for Thanksgiving. In the book, two boys are making popcorn. While one boys demonstrates a step by step process of popcorn popping (dos and don'ts), the other boy shares facts about popcorn. The illustrations and the story line convey humor, yet there is a lot of learning in the little book. This book is super versitale. My four year old was very engaged in the entire story, yet my fifth graders loved it too. Even my two year old loved hearing about the popcorn in a field that got too hot and started making popcorn "snow". Since Thanksgiving is this week (how did that happen?) 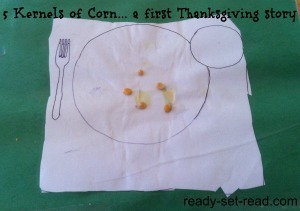 we focused all of our popcorn activities around Thanksgiving. First, we made a thanksgiving placemat. I told the boys the story about the 5 kernels of corn. The story is that in early New England, colonists put 5 kernels of corn on their plate to remember the days when there was very little food. In fact, food was rationed to just 5 pieces of corn a day. 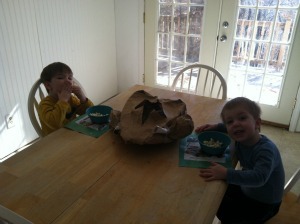 I drew a plate, fork, and cup and let the boys glue just 5 kernels of 'pop'corn to their plates. Then we discussed that we are blessed to have so much food. 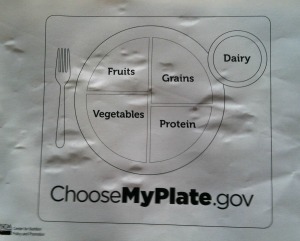 We talked about taking care of our bodies and eating balanced meals. We found some old magazines with delicious Thanksgiving food and we created Thanksgiving plates using a free template from choosemyplate.gov. We pasted a full plate and a 5 kernel plate on opposites sides of construction paper covered it with contact paper. It does make for a slightly bumpy placemat, but it works. 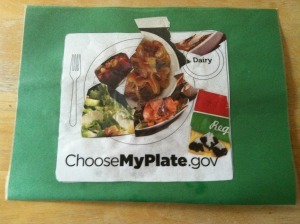 They boys have been using these placemats every day. I guess some of the moisture from washing them snuck through because one of the placemats is sprouting! Free science lesson. We also made a popcorn turkey. I found an adorable one on Pinterest from One Charming Party. 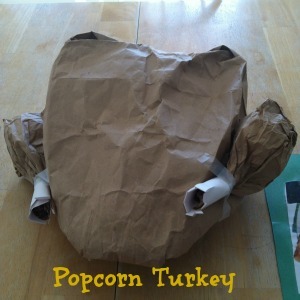 They have a great tutorial for making this bird out of paper bags and filling it up with popcorn. We made our popcorn on the stovetop following the directions from The Popcorn Book. I let the boys help me make our popcorn turkey so it wasn't quite as perfect. They loved participating. We used glue, duct tape, and scotch tape rather than a glue gun. Then we had a popcorn feast! 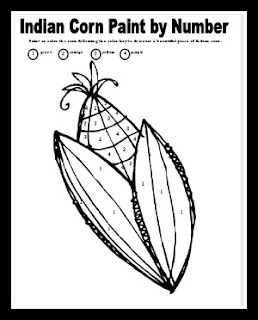 I also planned an activity to expanded our knowledge about other types of corn and explore "indian" or multicolored corn. I created this color by number coloring sheet. The plan was to use q-tips dipped in paint to fill it in. Nobody was very interested in painting the last few days, so the project has not been completed. I wanted to share the freebie with all of you in case your kids are interested. If mine take an interest in it, I'll update the post. 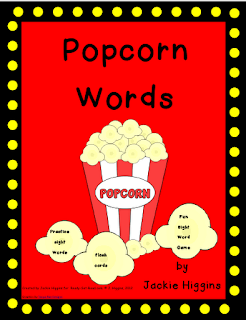 As a reading teacher, I couldn't have a popcorn unit without including popcorn words. 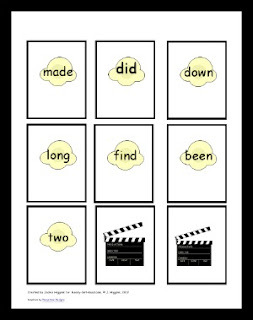 Popcorn words is a fun way to talk about sight words that pop up frequently in reading. There are many fun ways to practice popcorn words. We like to play pass the popcorn- a movie themed game. We fill a can (or a popcorn tub) with words and pass it. Each person reads the word on the popcorn. If the player reads the word correctly, he keeps the popcorn. This continues until a player gets the card that with the director's board. He says, "Cut" and everyone count their popcorn. The player with the most corn wins! You can get a free copy of this game by clicking on the picture below. Link up only posts inspired byTomie dePaola that share children's book inspired crafts, activities, recipes, etc. Any other posts will be deleted. Grab the button and share it on your post if you'd like. Ps. If you haven't been around much since the last book club, just a heads up I am now ready-set-read.com!! The old url will redirect you here, but it's an exciting change for me. So come back to Ready-Set-Read.com on December 1st to find out the December VBC author! What a great variety of popcorn activities! So much fun!